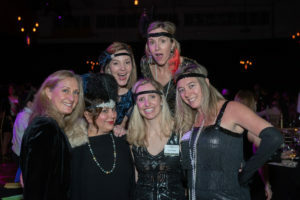 The Belmont Hill School gymnasium was transformed on March 16 to look like scenes from the roaring 20s jazz era for the Foundation for Belmont Education (FBE) fundraiser. Feather and pearl decorations, music, dancing, roaming characters, roulette and blackjack tables, signature cocktails, all came together to create the theme experience. The majority of the 300 guests for the sold-out event got into the spirit with flapper-style dresses, headbands and fedoras. One of the evening’s highlights was the presentation of $75,000 to Superintendent John Pehlan for Belmont Public Schools from the FBE. Funds were also raised through the silent and live auctions, which included items such as an ocean breeze Antigua getaway, South African photo safari and a Tuscan getaway. The dinner was catered by Belmont’s Cuisine Chez Vous. Event sponsors included Belmont Orthodontics and Belmont Pediatric Dentistry, Belmont Savings Bank Foundation, Belmont Smiles and Pediatric Dental Arts, Bennett Family Eye Care, Cambridge Trust Company, Cityside Subaru, East Cambridge Savings Bank, and Anne Mahon, realtor for Leading Edge Real Estate. The online auction is open through March 24 at 10 p.m. Visit www.fbe-belmont.org/auction to peruse the items and make a bid. To make a donation to the Fund our Future Campaign, visit www.fbe-belmont.org/donate. To date, the FBE has successfully granted more than $3.9 million in support of hundreds of projects initiated and organized by administrators, teachers, and staff.